This weekend we host, in junction with Café el Machete in Guatavita, the second exposition of this newly created art space in town. The first exposition, Mano en Mano, generated a very positive response, people have been attending the installed exposition, and asking for more events like this one in Guatavita. Doble Puntada is a women collective based in Villa de Leyva, another Colombian town two hours north from Guatavita. 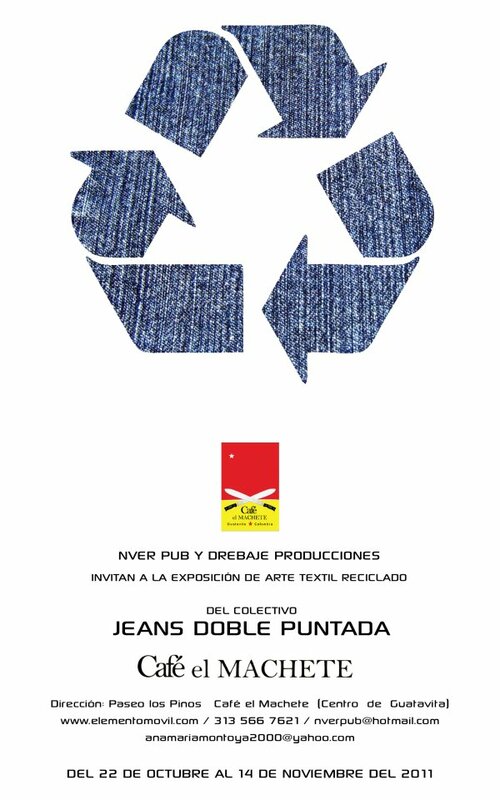 They have been utilizing discarded clothes, specially jeans, to confection new utilitarian or decoration pieces. The emphasis on recycling has driven this women to create educational spaces for children at Villa de Leyva, where they have taught a new relationship of responsibility towards discarded objects aiming at generating sustainability habits. At the opening of this exhibition we will feature the second screening of Cineto – Cine al Campo, introducing screenings that are part of a beautiful project, the Global Oneness Project which produces and shares films and educational material exploring and documenting interconnectedness in the present era, inspiring and triggering solutions to local problems through an understanding of oneness. We will keep you informed about this junction of projects, ideas, exchange and actions!! !